Make the gnocchi: Lightly flour a baking sheet. Put potatoes in a large saucepan; cover with cold water by 2 inches. Bring to a boil; add 1 tablespoon salt. Reduce to a simmer; cook until potatoes are very tender when pierced with a sharp knife, about 25 minutes. Drain potatoes. When they are just cool enough to handle, peel, and then pass through a ricer or food mill into a medium bowl. Sprinkle with flour, and add eggs. Season with black pepper and 1 tablespoon salt. Stir mixture with a fork to combine. Turn out dough onto a lightly floured surface; gently knead until it is soft and smooth, about 3 minutes. Divide dough into 4 to 6 equal pieces. Roll each piece into a long rope about 3/4 inch thick. Cut ropes crosswise into 1-inch gnocchi.Roll a cut side of each dumpling against the tines of a fork with your thumb so each piece has ridges on 1 side and an indentation on the other. Place on the floured baking sheet until ready to cook .Lightly brush a rimmed baking sheet with oil. Bring a large pot of water to a boil; add 1 tablespoon salt. Add half the gnocchi; when they rise to the top (after about 2 minutes), continue to cook until tender, about 15 seconds more. Transfer gnocchi with a slotted spoon to the oiled baking sheet. 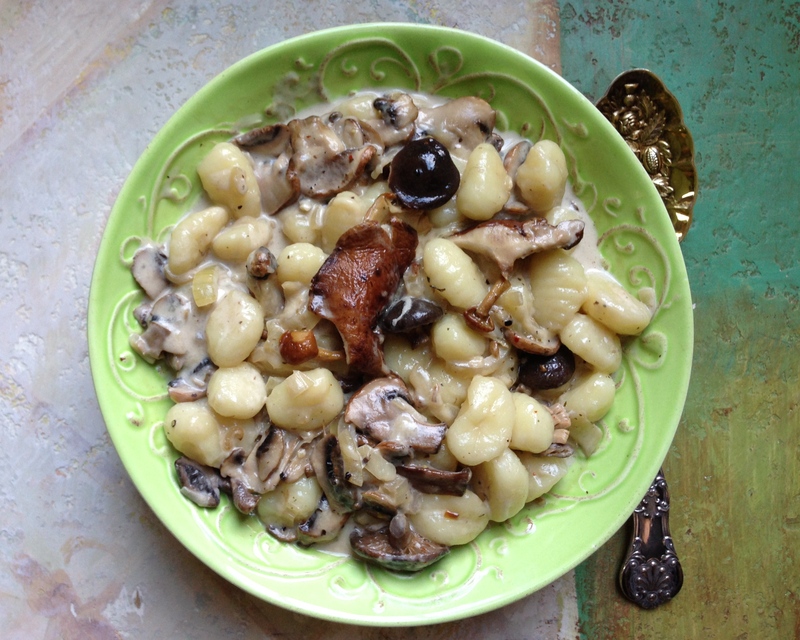 Repeat process with remaining gnocchi. Make the sauce: Bring cream and stock to a boil in a large saucepan over medium-high. Reduce heat, and let mixture simmer until slightly thickened and reduced by 1/3, about 10 minutes. Add Asiago Cheese ; stir until melted. Stir in nutmeg and season with salt and black pepper. Remove from heat; cover to keep warm. Heat oil in a large skillet over medium until hot but not smoking. Add mushrooms, and cook, stirring occasionally, until they are tender and their released liquid has evaporated, about 4 minutes. Add gnocchi; cook, stirring gently, until just heated through. 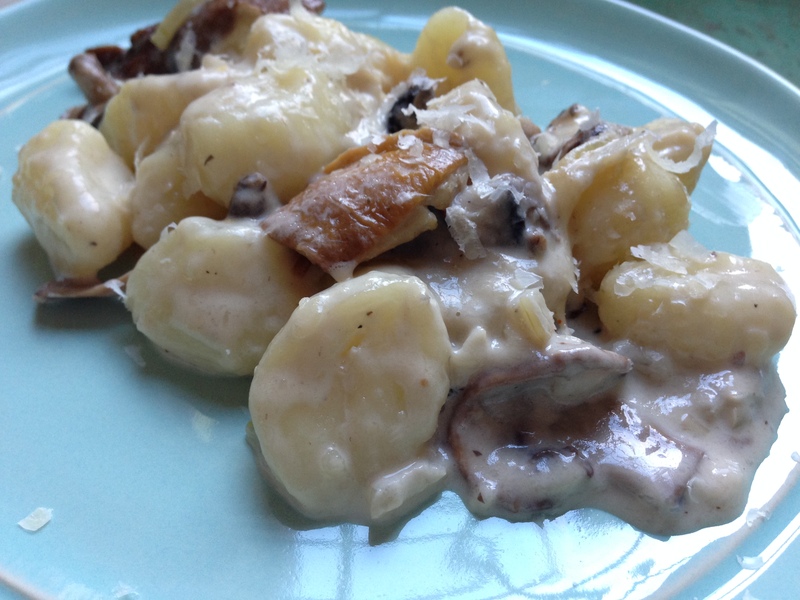 Pour cheese sauce over gnocchi and toss gently to coat evenly. Serve immediately.